Wrong-way accidents are just as the name implies: an accident caused by another driver going the wrong way on a street, highway or interstate. Wrong-way accidents are not terribly common but when they occur they typically involve a fatality because the impacts are usually head-on and severe. In fact, more than 350 people are killed each year in wrong-way accidents. By and large, wrong-way accidents involve a driver who is impaired by alcohol. So then, it will probably not surprise you to know that you are more likely to be the victim in a wrong-way accident at night and on weekends. You are also more likely to be involved in a wrong-way accident if you are driving in the lane closest to the median. Why? Because the wrong-way driver will typically move to the far right lane thinking it is the slow lane. Since they have been drinking, they choose this lane so they do not get pulled over for speeding. Finally, older drivers are over-represented in wrong-way accidents. Aside from cracking down on drunk driving, what can be done to prevent wrong-way accidents? In these types of interstate accidents, the wrong-way driver obviously could not distinguish the entrance ramp from the exit ramp. One recommendation is to use different color paint to differentiate the two. For instance, entrance ramps are painted yellow and exit ramps are painted red. 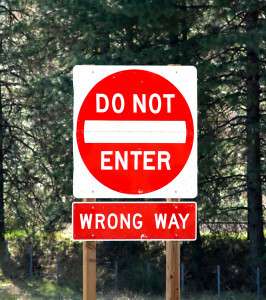 Lowering the “Wrong Way” warning signs has also been proven effective at preventing wrong-way accidents. Lower signs are more visible in a car’s headlights, which is important since most wrong-way accidents happen at night. And drivers who have been drinking tend to lower their heads, so the lower signs make it more likely they will actually see and react to the warning signs. The cost of lowering the signs is about $200 to $300 per ramp. The federal government has approved the use of lower signs but implementation is up to individual states. A Virginia Department of Transportation study found the majority of wrong-way accidents occur on diamond-type interchanges. Physical barriers along the pavement edge, pavement markings on the flared corners and minimum lane width have all shown to be effective at reducing wrong-way accidents. Dual-colored reflectors can also help avoid wrong-way accidents. These reflectors are white if you are proceeding correctly. If you are driving the wrong way, they are red. Some ramps are equipped with sensors which till trigger flashing lights and warnings if they detect a vehicle traveling in the wrong direction. If you or a loved one has been injured in a wrong-way accident and would like to discuss your case, contact one of our top-rated injury attorneys for a free, no-obligation consultation. We will review your case, answer your questions and advise you of your legal options. We handle all wrong-way accident cases on a contingency basis so we only get paid if we recover money for you. Give us a call at 615-742-4880 (Nashville) or 615-867-9900 (Murfreesboro) or 866-812-8787 (toll-free). Or, if you prefer, simply contact us online.